One of the great things about working with a brand with its factory - like Private White VC - is that it can be more responsive and flexible. And when they saw the response on Permanent Style to our new trench coat - which sold out in its first day - they were keen to help support with extra stock and sizes. So I'm pleased to say that next week we will have more stock - at least as much as this first run - and we will also be able to offer XS and XXL. The measurements for those new sizes are below. Please go ahead and places orders as before - for all six sizes - on the Permanent Style Shop. These will be fulfilled at the end of next week. And as ever, thank you all for your support. You can follow the discussion on The Permanent Style trench coat – new stock and sizes by entering your email address in the box below. You will then receive an email every time a new comment is added. These will also contain a link to a page where you can stop the alerts, and remove all of your related data from the site. Morning Simon and good news indeed. The article has now gone into my wife’s in-tray so I can only hope she gets the hint! This does however lead to a bigger question; why don’t brands like Private White (but of course not just them) make more classic RTW clothing. I did look very closely at their original product, but as you said, it was just too short. This is the perfect length and will I am sure sell well. If nothing else shouldn’t the overwhelming support for this coat give you more firepower when talking to brands about classic items and/or shouldn’t this make brands, particularly heritage brands sit up and think that maybe their is an untapped need out there from fairly affluent people who want to by clothing for the long term – a permanent style. I can’t quite remember how tall you are, but where would the coat sit on my 5’10 height? I don’t want it sitting too far below my knees…if that makes any sense. I’ve bulked up…i might be a Small (my ego talking), i’ll check sizing. Love it. Very Corto Maltese. In a dark blue would look fantastic as well. Irrespective once I have worked our best size will order. OK – hurry up though, only one or two left in each size, and Small sold out! Any views on coat sleeve length? I always assume that a raincoat’s sleeves need to cover jacket and shirt sleeves or whatever you’re wearing underneath. But increasingly they don’t (as you can see on Private White VC’s own website). Maybe as I have long arms I’m just overly sensitive to this problem…. Practically, yes they should cover the sleeves. I don’t mind it not covering on an overcoat as much, as the difference in cold protection is small, but on a raincoat you need it. Yikes. Looks like I’ve missed my chance at a small again (been traveling with little access to internet). I’m wondering how an XS would fit? Are the sizes listed with the liner or without? Also, for my education, exactly how is the centre back measurement taken? It appears that all of the other measurements for XS would be large enough for me except possibly the shoulders (43 cm measured typically there). Superb! Any chance of keeping this going ’till around Christmas? I might be able to – and allowed to! – buy one by then. Well if Private White do that they could beat out Burberry with their unorganised shops poorly stocked and gender fluid focus. I’m surprised that a heritage brand is willing to sacrifice it’s range just to compete with fashion houses like Gucci whose products can only appeal to a minority of men. Simon – is that it for size small for the foreseeable future? Yes, for at least a few weeks, sorry. We’ll update here if there are any plans for more. can I just say I think Ian’s comments on Burberry is spot on. I used to love their stuff and now avoid their shops like the plague. Why do heritage brands do this? I can remember years ago (1975) going into Abercrombie and Fitch on East 45th to buy some wonderful sporting cloths and a tent that I used until 2004. Look at them now- rich and famous sure, but quality clothing? Burberry are going the same way. 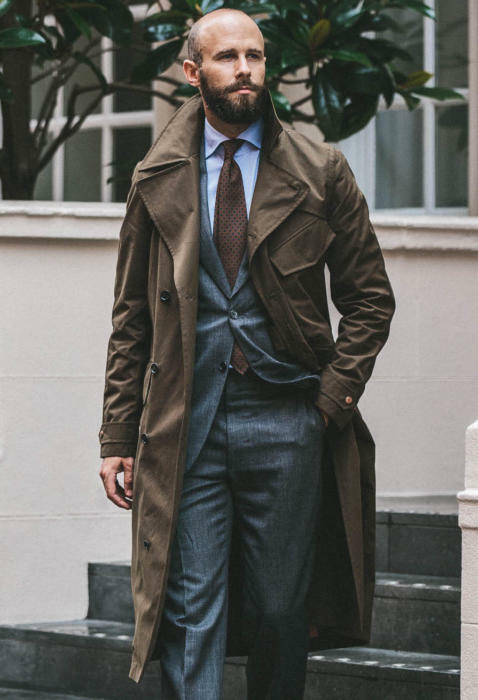 Another source for a fairly decent trench might be Aquascutum who do a “Bogart” trench – slightly shorter than this but on the knee – however that is hitting £1000. Actually disagree with that. I enjoy Burberry – always nice to browse their London or Prorsum range, a nice mix of classic/traditional and fashion. On the other hand, I don’t rate Aquascutum, especially after the countless ownership changes in the past 5-6 years. They have clearly lost their identity and the brand isn;t working. Grenfell is producing trench coats again. Re: Burberry. I have had a long trench for 4 yrs, it’s the wide fit with open side pockets which you can reach through, i.e. into your jacket’s pocket so you can take e.g. your cell phone out. Burberry doesn’t produce this model anymore, even their longest model is fitted. Mine was older stock in a little menswear shop. “They only let us have 3-4 coats, obviously they focus on China”, I remember the shop keeper said. Later there was a minor issue with a loose seam, Burberry repaired it and vacuum cleaned and impregnated the trench for free. The service with their stores in London has been outstanding. I love the look of the coat. It reminds me of one I had when I was in my early 20s. But I’m only 5’7″ with a 42″ chest. You’re 6′ and wear a small, which suggests that the large would be too long for me. If I did bite the bullet, would it be warm enough with a heavy sweater underneath to substitute for a parka on a cruise around the coast of Norway in the winter? Beautiful coat! Any plans for other colors such as khaki in the future? I have been enjoying the trench so thank you. As the weather is turning, I am thinking in getting a wool version – is it common for a wool trench? Not sure what colour this is but how versatile is this do you reckon? I’m going to commission a trench in an H&S cotton for F/W/S wear. I live in the southeast US, so it never gets too cold — this is for rain protection and moderate warmth. I like the comfort and ease of wear that raglan offers, and I almost never wear suits — mostly separates in non-worsted cloths. So I’m curious what you see as the pros and cons of each shoulder construction. will there be restock anytime soon particularly with XS? Has the XS been restocked? I am interesting in getting one but my normal PWVC size(size 2/XS) is currently sold out. Are you getting a restock anytime soon or is this a one off thing and never be done again?